For a scientific paper, the study just published online by Nature starts out more like a bit of poetry  or maybe it's more like a romance novel. "Europa," it begins, "the innermost icy satellite of Jupiter, has a tortured, young surface." That just about sums it up, though. Europa was discovered by Galileo almost exactly 400 years, ago, when he first pointed his primitive telescope at the night sky. But it wasn't until the Galileo space probe arrived in the 1990s for close-up surveillance that astronomers began to understand its true nature  a rocky core surrounded by a world-spanning ocean scores of miles deep, and topped with a thick coating of cracked, gnarled ice. That being the case, and liquid water being considered an essential element for life, scientists quickly realized that Europa could harbor its own, homegrown biology  in principle, anyway. And that triggered an intense focus on understanding details of exactly how Europa is put together. 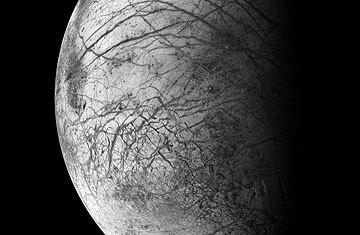 The new paper is the latest leap forward: according to lead author Britney Schmidt, of the University of Texas at Austin, there's evidence for a giant lake encased within Europa's shell of ice, above the ocean that lies deeper. And that might raise the odds of European life at least a little bit. To understand why, you first need to understand how liquid water can possibly exist on a world nearly half a billion miles from the warmth of the sun (Earth, by contrast, is only a fifth as distant). The answer is that Europa's rocky core is constantly flexing under the tidal force of Jupiter's gravity and the gravitational plucking of the other large moons as they pass by. The friction generates heat, just as a rubber ball heats up with you squeeze it rapidly in your hand. All that heat keeps the overlying water from freezing, until you get relatively close to the surface. Put solid ice on top of a sloshing ocean and you get cracks, which are clearly evident in the images from the Galileo probe. But a closer look at those images reveals dark patches of especially rough surface that planetary scientists have come to call "chaos terrain," appropriately enough. "We've always thought it represented some sort of interaction between ice and water," said Schmidt at a NASA press conference. "But how it works wasn't clear." One big source of confusion: while chaos terrain typically has huge icebergs embedded in a brownish material known as "matrix," some patches are sunken below the surface by many hundreds of feet, while others bulge outward. "Why," asked Schimdt rhetorically, "are they so different?" By looking at vaguely comparable situations on Earth where warmer water lies underneath ice  ice shelves in Greenland and Antarctica floating on warmer water, land-based glaciers overlying active volcanoes that melt the ice from below  Schmidt and her co-authors came up with a theory that seems to fit. "Imagine," she said, "the surface of Europa, made of thick, fractured ice." Water, warmed by hot spots at the bottom of the sea, rises up through the cracks, forming a temporary lake, just a mile or so below the surface. The water weakens the overlying ice, causing it to slump; huge icebergs on the surface sink into the matrix, a quicksand-like pool of crushed ice, rolling and tumbling as they go. Then the lake gradually freezes, expands and pushes the jumbled bergs outward again. All of this bulging and collapsing constantly rebuilds Europa's surface, which is what the scientists mean when they call it young. But it also adds up to a sort of grand unified theory of that surface. It explains the depressions, like a feature called Thera Macula, where a lake presumably sits; and it explains bulges like Conamara Chaos, where a lake has refrozen. "It's very exciting," said planetary scientist Louise Prockter, of the Applied Physics Laboratory at the Johns Hopkins University, who appeared at the press conference as an independent expert. "It ties together a lot of loose ends." Most of them have to do with the dynamics of ice and water, but another mystery has long troubled Europa watchers. You do need water for life, but you also need organic chemicals, and while the oceans are presumably rich in salts and other minerals, that's not enough. The life-building chemicals could easily have been delivered by the hydrocarbon-rich comets that occasionally pummel planets and moons alike  but they would somehow have to make their way down into the oceans. The existence of near-surface lakes implies a network of cracks that could provide such a route. Put it all together and you're still a long way from proving there's even primitive life in Europa's ocean. But the prospect is tantalizing enough that a Europa lander that would drill down to put a probe into the subsurface ocean got a high priority in a recent advisory report to NASA. Within a couple of decades  assuming NASA's budget survives the next few years without harsh cuts  the mystery of what lies beneath Europa's young and tortured surface could finally be solved. See pictures of deep space from the Hubble telescope. Read about finding an ocean of fire on Jupiter's moon Io.